Fishermen in coastal districts are taking preparation to go to the Bay of Bengal to catch hilsa as the 22-day government ban on fishing the delicious fish comes to an end on Monday. The government imposed a ban on catching, selling, hoarding and transportation of hilsa in different rivers for 22 days from October 7 to 28 to boost Hilsa output through protection of the mother fish during its peak breeding season. During a visit to KB Bazar Ghat adjacent to Doratana River on Friday, the UNB correspondent saw the fishermen preparing their trawlers and fishing nets to go to the Bay of Bengal to catch hilsa. Trawlers were being towed to rivers from the dockyard. Fishing nets, fuel and daily essentials were being loaded in the trawlers. Thousands of fishermen are waiting to start their journeys to the sea. 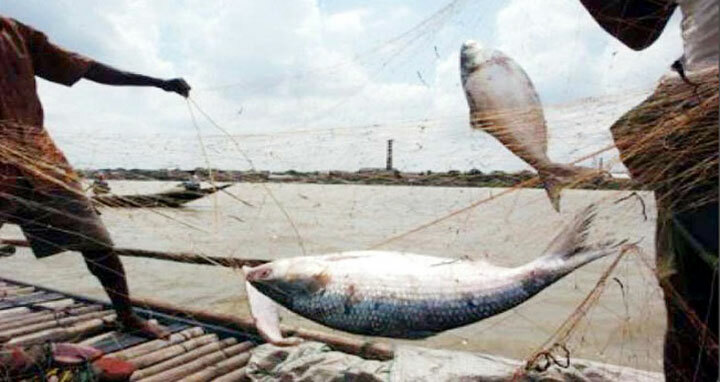 Local fishermen alleged that fishermen from India enter Bangladesh water territories illegally to catch hilsa during the ban. They demanded government steps so that the Indian fishermen cannot enter Bangladesh territory. Officials at the Fisheries Department, Bangladesh Navy, Coast Guard, Air Force, district and upazila administration, police, Rapid Action Battalion (RAB) conducted drives to prevent hilsa fishing during the period. Besides, executive magistrates conducted mobile courts and punished a good number of fishermen who violated the ban. Haque Islam, a fisher of ‘FB Sabbir’ trawler of Khulna district, said that they returned to the ghat from the Bay on October 6 obeying the government ban. Now, they are taking preparations to go again for catching hilsa. Their trawlers and nets are prepared to resume fishing. Sheikh Idris Sheikh, president of Bagerhat Coastal Fishermen Association, sought government steps so that foreign fishermen could not enter Bangladesh territory to catch fish. Zia Haider Chowdhury, district fisheries officer, said, "Now we've to save Hilsa fry (under 10 inches). The authorities will impose a ban on catching Hilsa fry from November 1 to June 30 in coastal areas." According to the information of the Department of Fisheries, there are 16.20lakh registered fishermen in the country. Among them, a total 39,103 fishermen are in Bagerhat district. The production of hilsa in 2017-18 fiscal year was 5.09lakh metric tons.